Once again GoPro Inc. has come up with the most astonishing camera you have ever seen. GoPro (previous name was Woodman Labs Inc.) has already been known and famous for manufacturing the most developed and high definition personal use camera. And its latest product has changed the conventional concept about cameras. GoPro Hero3 Black Edition is now the photographers’ first choice who use to take photos at adverse conditions and harshest of situations. The GoPro Black Edition is small in size and yet is able to capture and record with high definition and resolution. When it comes to extreme adventure and sports cameras as well, GoPro has gained the market leader crown with ten year’s experience of manufacturing the cameras of best quality. And this latest edition has strengthened its position more strong. Being the flag bearer in the Hero3 product line, it has also three other edition which are the Silver, White & the Surf Edition. The last one is designed and established in such a fashion that it can be mounted to a surf board and tae the pictures. No wonder that it is called the most versatile camera of all! The GoPro Hero3 is lighter and smaller compared to its previous editions. But built in Wi-Fi connection, HD resolutions of the highest standard and ultra high definition capture modes with high frame rates have made it the most desirable camera that any one wishes. It is lighter than its previous one by 25 percent and also smaller by 30 percent. Its thickness has also been reduced in to 20mm only. On the front side, there is a six element f/2.8 aspherical lens that is made to offer you twice the sharpness of the image and also remedy the barrel distortion amount with its 170 degree viewing field. On the back side, there will be a removable cover for 1050mAh lithium ion battery. There will also be BacPac connection attached to it. The Hero3 Black Edition offers the fastest and newest processor with twice the horse power of the Hero2. It can capture and record 1080p HD video up to 60fps, 720p HD up to 120fps with 960 HD video up to 100fps (4:3 aspect ratio). If you buy this GoPro Hero3 camera, along with it you will be getting a handful of accessories that are needed for you to get going. There are a Wi-Fi remote (worth of $80), waterproofing housing, two swift release buckles, two sticky mountains (where one is curved while the other is flat), a charging cable with a 3 way pivot arm. 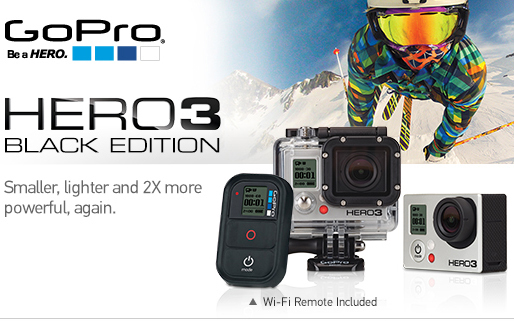 With all these features and many more yet to cover; this GoPro Hero3 Black Edition will cost you $399.99. Still if you have any doubt in mind about the fascinating features and abilities of the Hero3 Black Edition; let me put you in to a little secret. You must know about the program called ‘the Deadliest Catch’ where photos are being captured and videos are recorded in the most exotic situations. Can you take a guess what is being used by the crews of that program? Yes, it’s GoPro cameras.